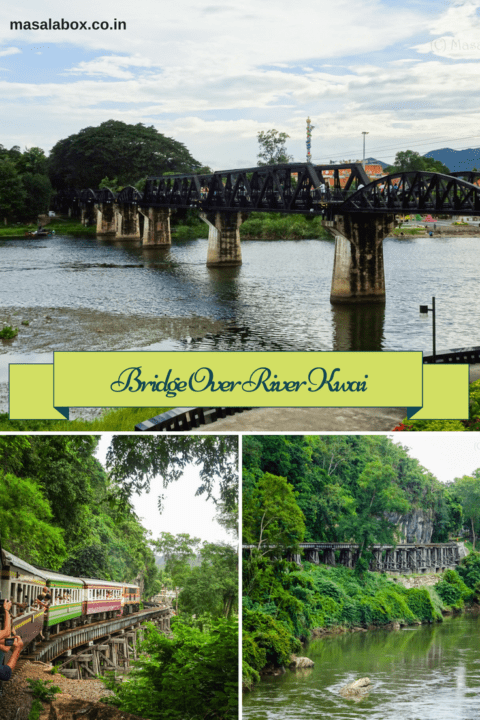 Have you watched “The Bridge over the River Kwai” movie? I haven’t. 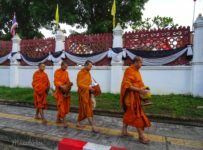 Do you know about the Thai-Burma railway also known as the”Death Railway“? 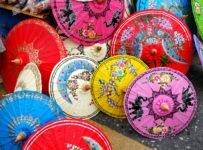 I did not know until I visited Kanchanaburi, Thailand. I kind of felt dumb of my ignorance for not knowing about the Burma Railway which was constructed during the second world war. I was totally unaware of the emotional rollercoaster ride am about to embark on visiting the Death Railway. 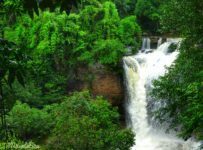 Because I had not looked upon the places to visit at Kanchanaburi and my mind was only filled with visiting the stunning Erawan National Park and did not have any idea about the Death Railway. It was mid afternoon when me and my friend arrived at Kanchanaburi, a small city to the west of Bangkok. 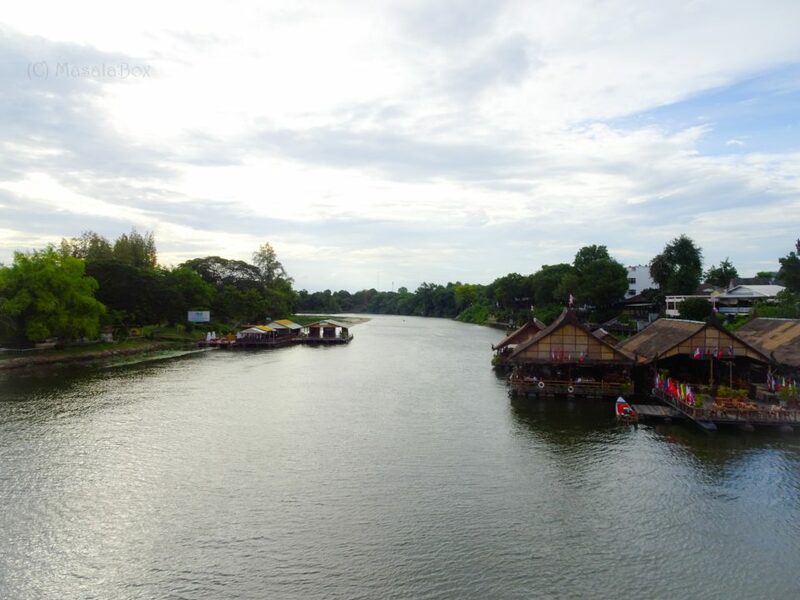 However, we were traveling from the east of Thailand where places were not yet touristy and found a strong contrast in Kanchanaburi which catered to the tourists from Bangkok. 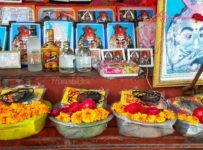 Streets lined with bars on either side, pubs screaming away loud music in the evening, tour operators stuck posters everywhere, the tuk tuk guy comes along hoping you would hop onto his bike and the massage parlor girls calling out to you. I was staying at one such lively streets. I was still not aware what Kanchanaburi had in store. After freshening up, I googled to see the things to do and the top of the list was “The Thailand-Burma Death Railway Centre”. It showed just a kilometer from the place I was staying and it fit perfectly into the afternoon plan. My roomie squirmed at the thought and said, “You go if you want to, am not going to be part of this!” Wondering where was this sudden outburst coming from, I asked what was the matter and she was like, “don’t you know about these places, they are very disturbing!” It still did not strike me and I was like, “You do not want to do the number one item on the must see places? That is totally crazy! Am going anyway..” She did come along with nothing else to do for the noon. But she was right! Should not have gone there. 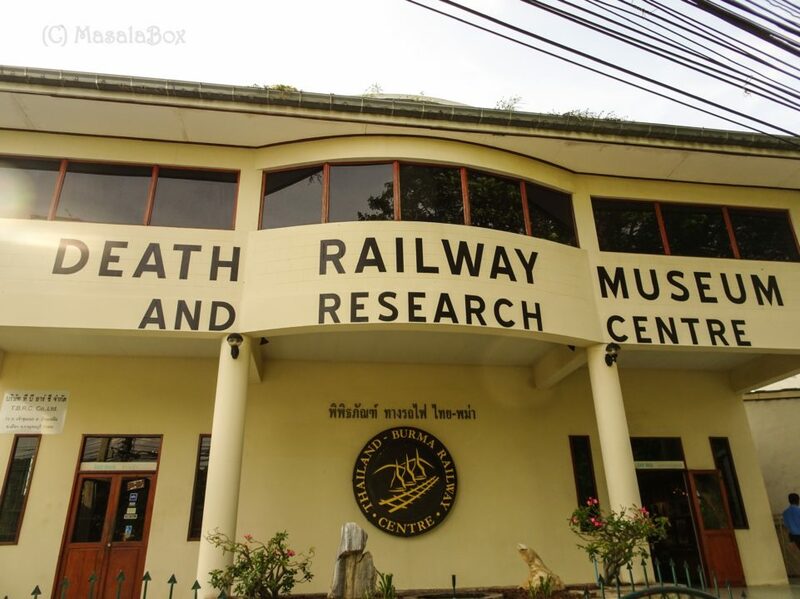 Standing in front of the Thailand-Burma Railway Centre commonly called as the Death Railway Museum, it looked like small building or a library with no pomp and show. A banner read to maintain silence and pay respect. Got my tickets and moved in to explore the museum. The music of train chugging around was heard in the background. Above me on the roof was the model or the section of the wooden railway trestle bridge that was constructed during the second world war. Another turn and I was staring at the empty eyes boarding the train to Bangkok to start their work on the Burma bridge.. The history then unraveled in front of me..
During the second world war, lives were lost not only because of the bombings but also because of holocausts, massacres, punishments, inhuman treatments leading to starvation and diseases. The Death Railway is aptly named so because one sect of men thought they are superior to the other, that they can exploit the manpower to such extents that many lost their lives constructing the railway. World War 2 was when Japan was predominantly trying to establish its dominance over Asia and Pacific. By 1942 Japan had already invaded Thailand, Philippines, Malaya, Burma, Singapore and along with it captured and imprisoned, British, Dutch and Australian soldiers. Rangoon being a strategic port and capital of Burma, was always under attack and the commonwealth nations were again teaming up at the India Burmese border for an attack. It was getting difficult for Japan to send resources all the way to Rangoon as quickly as possible considering south east Asia was full of dense jungle, which holds true even today. The only sea route that Japan had access to Rangoon was exposed to bombings from aircraft and submarines that Japan was finding it a hard time to provide ammunition to its soldiers fighting at Burma. So Japan decided to come up with a land route between Thailand and Burma and transport goods through this route which is safe, as both the territories fall under them. And thus the Thai-Burma Railway was planned to be constructed by the Japanese. It was 250 mile rail link running between the countries, majority of which falling through the tough terrains of Thailand. In the late 1800s when British were looking to build a railway line between Thailand and Burma, they analysed the route, found it to be too treacherous and rough that they dropped the plan. Japan takes up the same route, decides to come up with the rail route and that too keeps a deadline by 1943!! Just a year. All with the thought that they have the 60,000 prisoners of war at hand plus hire labor from their captured territories through a contract. Now imagine this. I stay at Bangalore, India and the year is 2017 where the technology has advanced much much much more. We now have machines that can actually drill through earth to form tunnels. 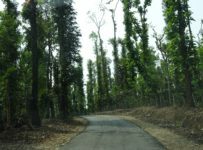 Our metro lines are not cutting through forests. It is going through a well developed city. Yet! Yet, it took four years to complete and operate a 26 mile stretch of phase 1 metro railway. But the Japanese with no modern equipment decided to construct a 250 mile railway track through thick dense jungle, over the khwae noi river, in just a year!! The Thai – Burma railway construction began in such a way that one set of construction begun from the Burma end and another from the Thailand side. About 60,000 PoW (Prisoners of War) were deployed into the work. As this labour was not enough, people were hired through contract from the south ease asian countries. 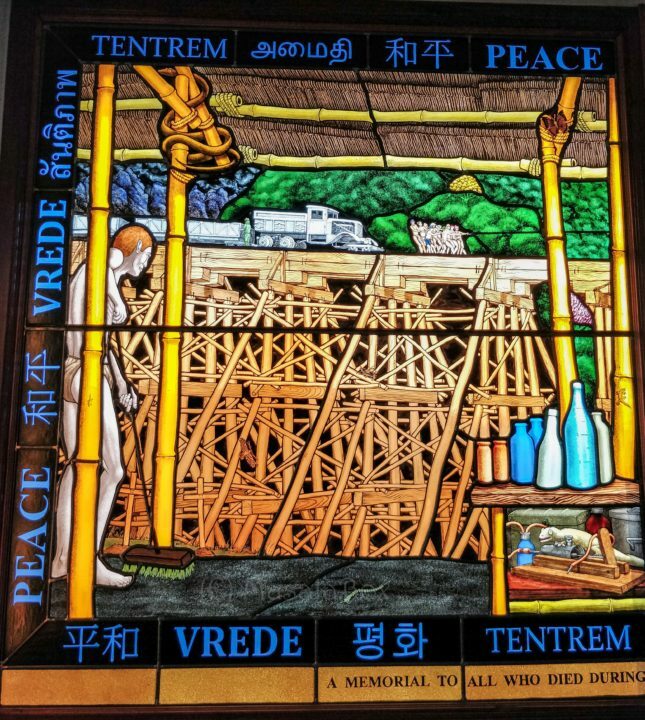 This included Thai, Burmese, Malayans, Tamilians, Chinese, Javanese, Singaporeans, Dutch and other small percentages. Initially it was advertised with promise of high wages, good food and to bring the family along. But the reality soon struck when they arrived to board the train with open bogies and people were crammed into the bogies. The state was such that they had to stand and sleep, and that if one has to pee he would stand at the door and the other would hold him. This long train journey itself proved fatal for some. I would say they are the blessed, because the campsites were at even worse conditions. Dumped into sites with little to no food, long work hours of more than 16hrs, no medication, no proper sanitation! People soon fell sick and impoverished. Once the news of these campsites spread, further laborers refused to join in and the Japanese had to force them and found cruel ways to hire them. This kind of forced laborers are called Romusha, about 2,00,000 of them! While the PoW and Romusha ploughed through the earth, their conditions deteriorated faster and faster. Diseases like cholera, dysentery and malaria caught on. The museum has photos of them and video clippings which moves to tears. Just a bag of bones, lifting up those heavy wooden planks and setting up the railway track is an unbelievable sight! Their ordeal doesn’t stop there. A particularly difficult period called “Speedo” kicks in sometime mid 1943 to push the completion schedule ahead of time. Like it was already not so tight a deadline and not that already more people were dying. 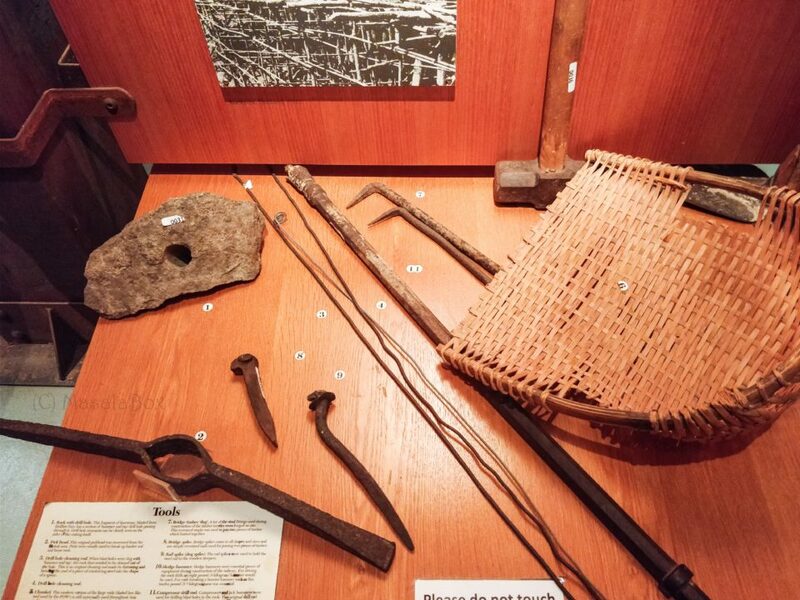 The museum also shows the things used by the prisoners. Sometimes a letter from faraway land or the letter that they never posted. Writings on toilet paper or leaves, using hair as brush and pen, simple tins or vessels, the pictures of their beloved.. When it was not the Speedo period, it is said that the workers tried to keep up their spirit high by singing or playing music. They formed support groups among themselves to help each other through their loneliness and sickness. Not just that, they also knew that they were building a bridge which eventually helps their enemies. So they come up with simple sabotage plans to break the railways. 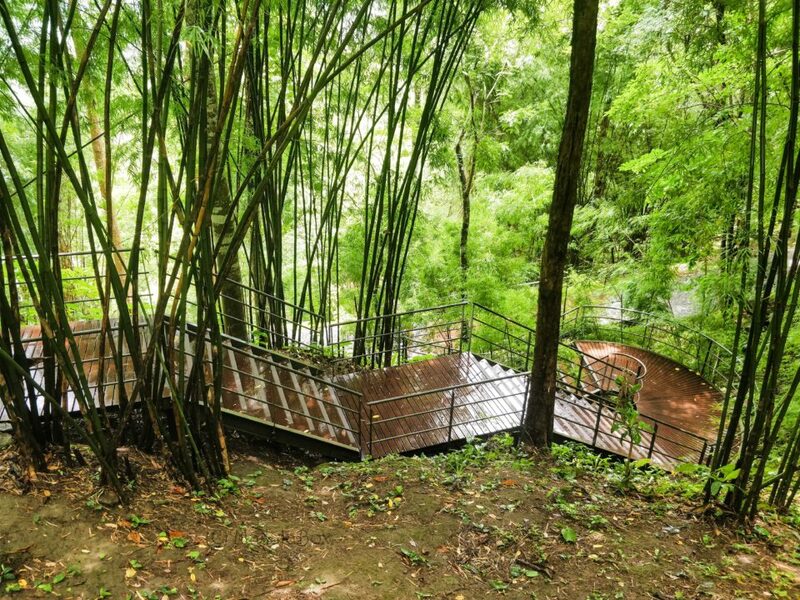 Like keeping a termite or white ant nest near the wooden bridges hoping that the nature would take its course. Or sometimes replace the timber with lesser quality wood. Doing it in such a way that the Japanese did not know about it because anything that has an immediate effect would mean repeating the work or come under severe punishment, maybe even death. However I also couldn’t stop wondering how 60k soldiers who were working as prisoners of war were not able to stand up against the Japanese while at work. They are soldiers trained to fight right?! 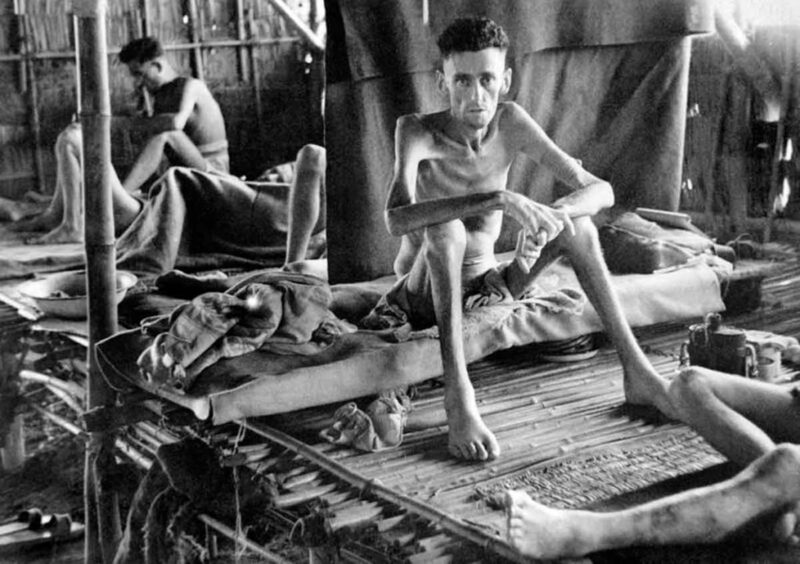 By the end of this Siam – Burma railway completion about 12,000 PoWs and nearly 1,00,000 romushas had lost their lives! There is also a note that there is no account registered about many romushas and hence their death was also not noted down! Especially the Tamils and few other Asians. The Death count could be much more than what is shown in these accounts.. The next day I had signed up for a half day tour of Erawan waterfalls and half day tour of Death railway. 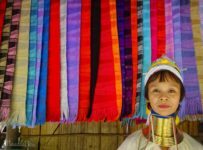 The death railway tour consists of visiting the Thom Krasae Cave and hopping onto the train that goes through the famous Thom Krasae Bridge. 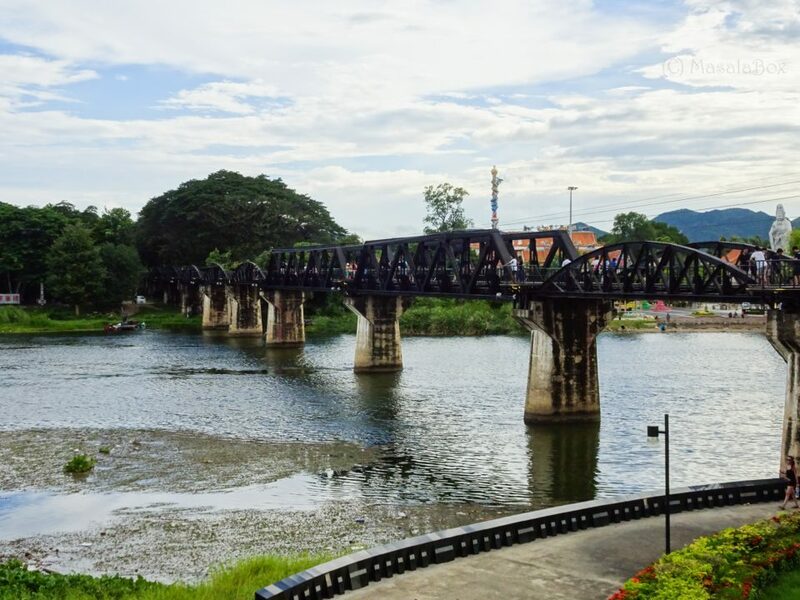 The majority of the railway line passes by the side of the Khwae Noi River, known as River Kwai in English. And at one section just before the Kanchanaburi station the railway line goes through a bridge crossing the river. This is the famous Bridge on the River Kwai section. This bridge was however damaged by bombing during the war. A section of the remanants can be found at the museum, not sure if I saw it in the Hellfire pass museum or at the Kanchanaburi one. The bridge was repaired later and one can see the difference in the porton between what was made then and later. It was around 3pm when we arrived at the Thom Krasae cave. Along the course of the railway construction many caves like this were used to stock up the materials and resources, to keep it dry. 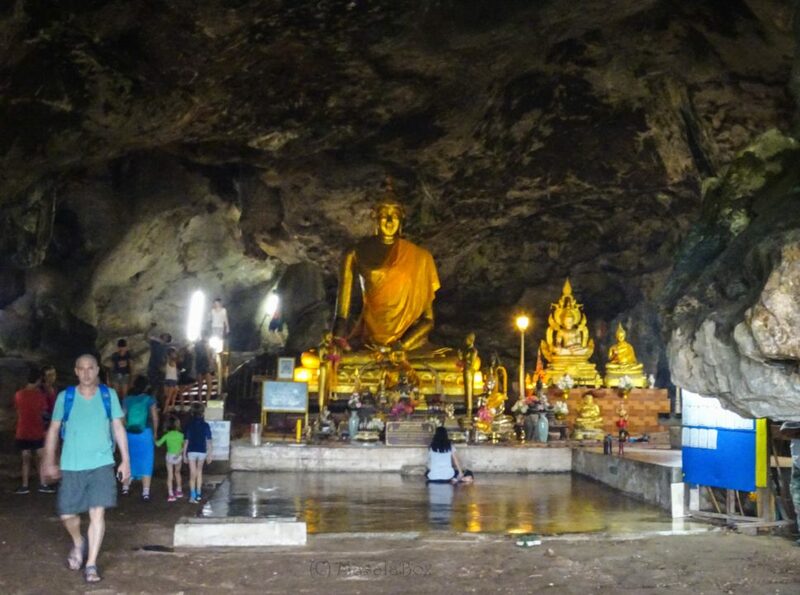 The Thom Krasae cave is popular to the tourists as it is right before the Thom Krasae bridge and also it has a beautiful Buddha statue installed inside it. It is a big wide cave that one can stop by and then one can walk along the railway line for a short distance. In spite of all the cruelty and the tragedy that went into the construction of this railway bridge, I cannot stop wondering with awe at this engineering marvel. 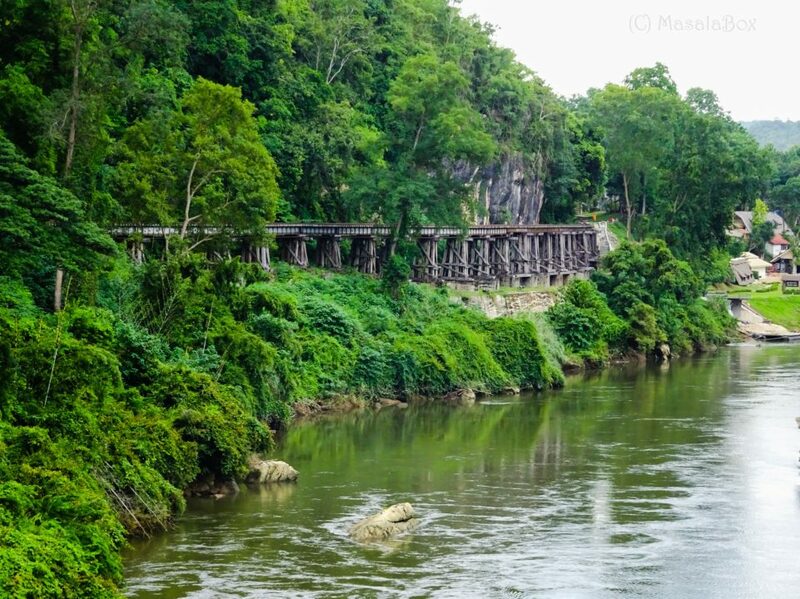 A steep cliff, the Kwai river flowing along and a three tier wooden trestle bridge over which the railway tracks are laid and the train chugs along it precariously. It is a sight to see! By 4pm the colorful train arrives at Thom Krasae station and we hopped into it. There are plenty of tourists already in. There is kind of no place to sit. The train chugs over the wooden trestle bridge. Almost everyone hanging out the window to take a good shot of the train curving along the hill and the river. For a moment I thought with all the weight leaning towards one side of the train, it is going to topple off into the river! It goes clickety clank over the bridge making weird noises.. I looked down at those strong wooden track. I further look at the gushing river and wonder how did man ever balance himself and constructed at such a place! Most of the tourists get down at the subsequent stations, so did we. Different tours operate different way, however I liked my tour as I got to explore the Krasae cave also. We then drove to see the bridge on the river Kwai. The same train will eventually pass through this bridge but it takes time, so the tour operator drove us there to show the bridge around. Walking through the iron bridge gave me chills, made me wonder how the conditions would have been then, how did they manage to construct this and many more emotions stir in. However it was momentary. 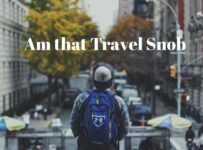 The place is filled with cheerful tourists that you forget these thoughts and get engrossed in the silly photographs that each one tries to take.. This was however not enough for me! The museum had so much impact on me that just walking on the bridge over River Kwai was just not enough. 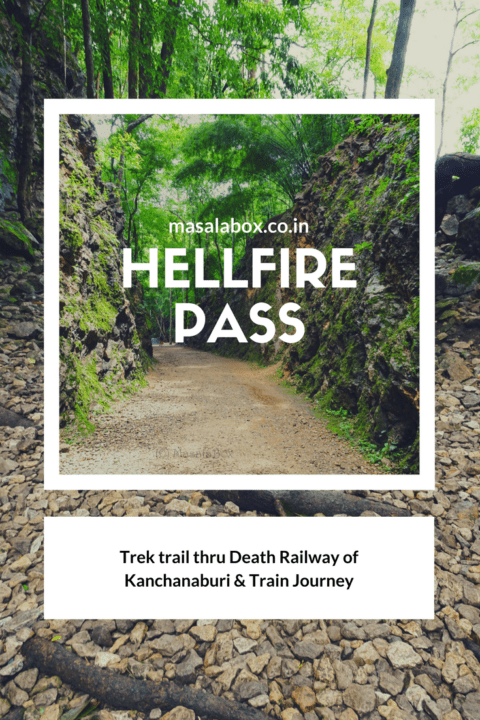 So the next day me and my friend decided to take the complete train ride all the way from Nam Thok to Kanchanaburi and check out the Hellfire pass by ourselves. Hellfire pass, the most difficult section of the railway line. 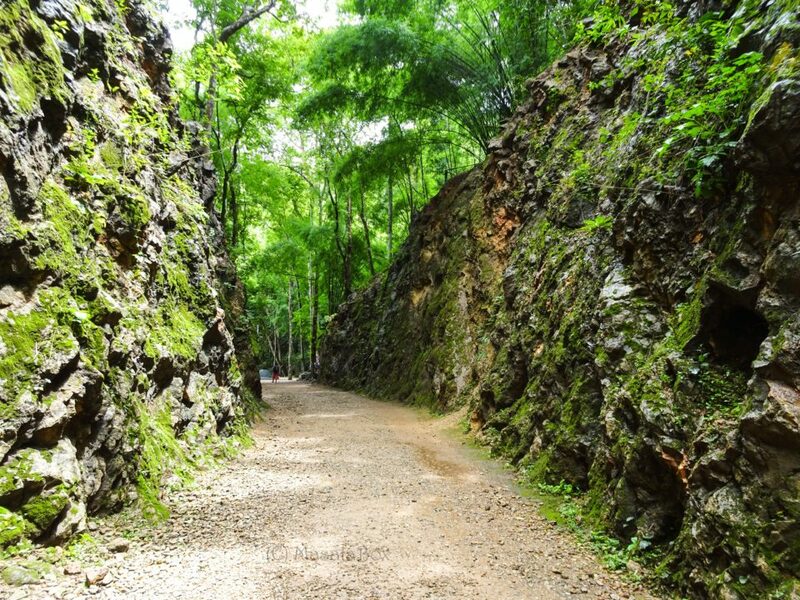 Hellfire pass is a particularly difficult section of the railway line, close to the Burma border in the Tenasserim Hills overlooking the Kwae Noi Valley. The railway line passes though huge rocks! Cutting of the line has been made through the mountain, splitting apart rocks amidst a dense jungle. Ideally what one would do is tunnel through a hill, right! But tunneling would mean people working on either end of the tunnel, paving way through the rock. With so much romusha and PoW at hand, and the need to finish the railway line as quickly as possible, the Japanese instead decided to split the rocks, level it and lay tracks, though this is much harsher way than tunneling. With workers working in shifts after shifts, with torches alighted in the jungle creating eerie shadows and all the noise emanating, it resembled just like hell that it was named HellFire pass. We boarded the bus from Kanchanaburi to Hellfire pass. Not so difficult, we went to the bus station and asked for hellfire pass and got into a bus they pointed to, informed the driver and conductor to stop at hellfire pass. There was yet another foreign couple who did the same. 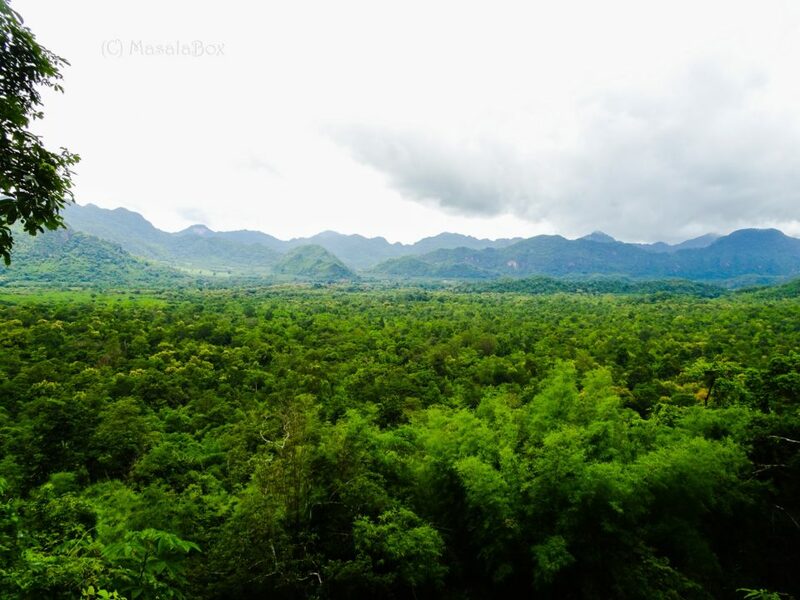 The bus passes through Nam Thok and Sai yok national park. Since we are almost reaching the Burma border, the Thai police got into the bus and did a quick checking. The bus dropped us at hellfire pass what suddenly appeared to me like landing in Switzerland. 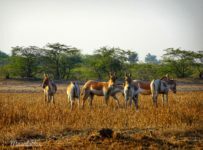 The place was surrounded by hills, lush thick green hills and meadows. There was even a farm nearby and made it feel just like alps in summer. 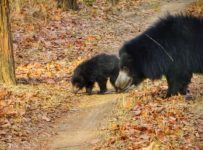 A fresh spell of rains had left behind wet roads, rain drops on the grasses and this means a muddy trek path. 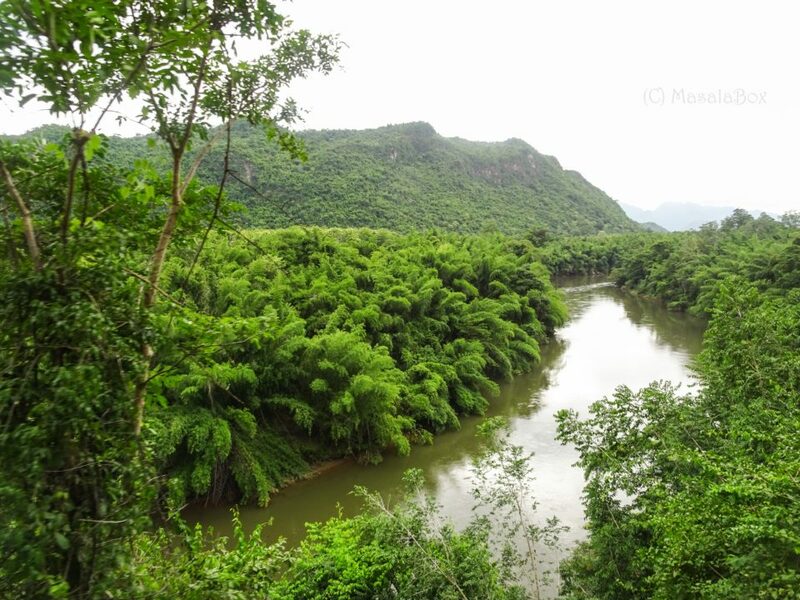 After the second world war the British ripped apart the railway line from Burma to most of it here and there, to avoid the Burmese and Karen from entering into Thailand. 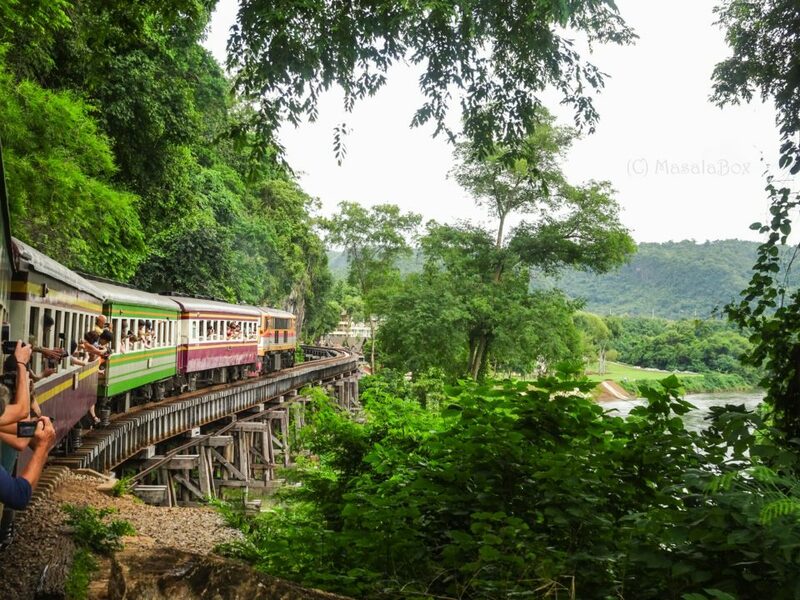 The railway line runs from Three Pagoda Pass which is a gateway from Burma to Bangkok. Much of this line was as such damaged here and there through air bombings during the war. The railway line was then sold to Thai Railways and the portion from Nam Thok to Bangkok is still functional. 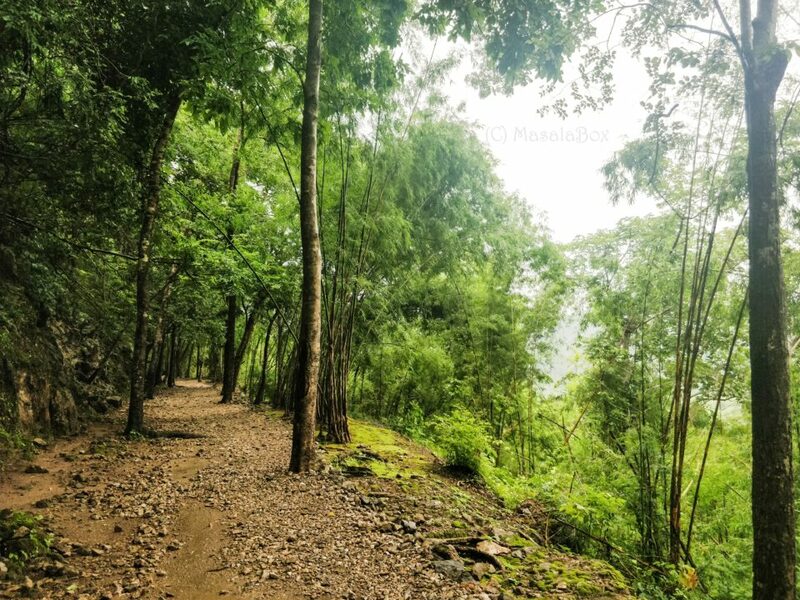 The four kilometer stretch that runs through hellfire pass is now open up for hiking; for us commoners to walk through the same path where once sweat and blood was used to build the railway line. 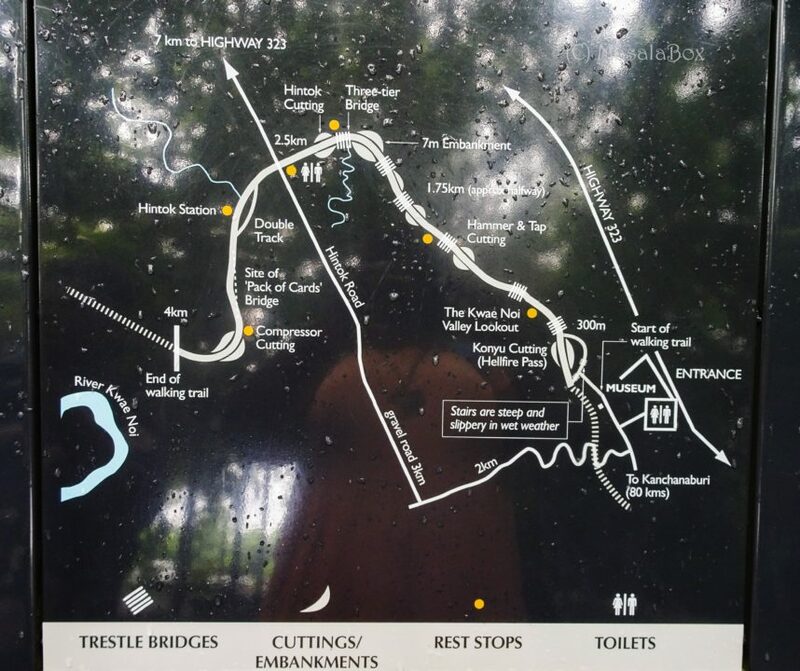 The hike trail goes upto a landmark called compressor cutting however the last when I visited, got to know it is open only till Hintok cutting. 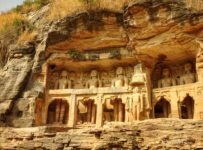 These landmarks are named after the cutting process that were used to get through the rocks. 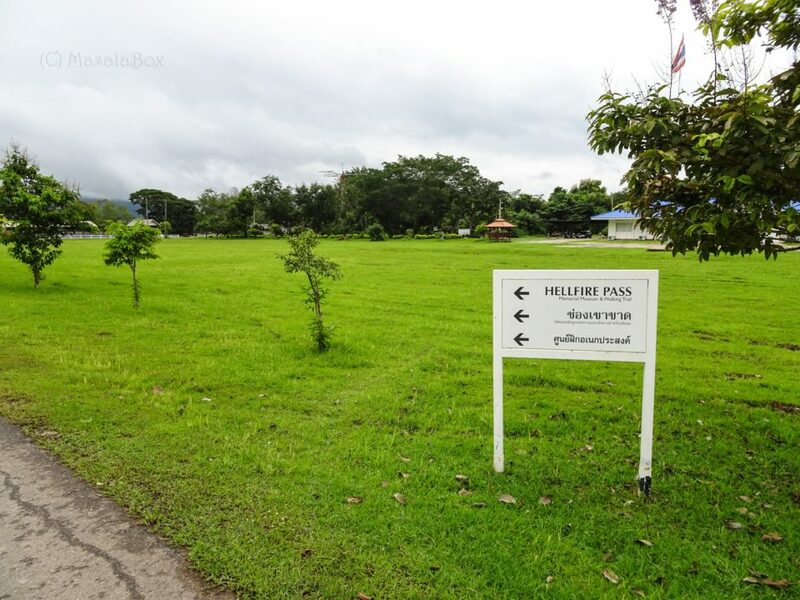 At the start of the trail is a museum which is similar to that of the one in Kanchanaburi. Collect the audio guide from here and set on your trail. 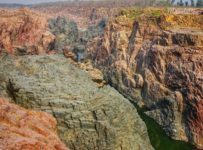 You can also arrange for a pickup from Hintok cutting, the last point in the trail, at the museum before you start of the trail, that if you are determined to complete the 2.5km stretch. 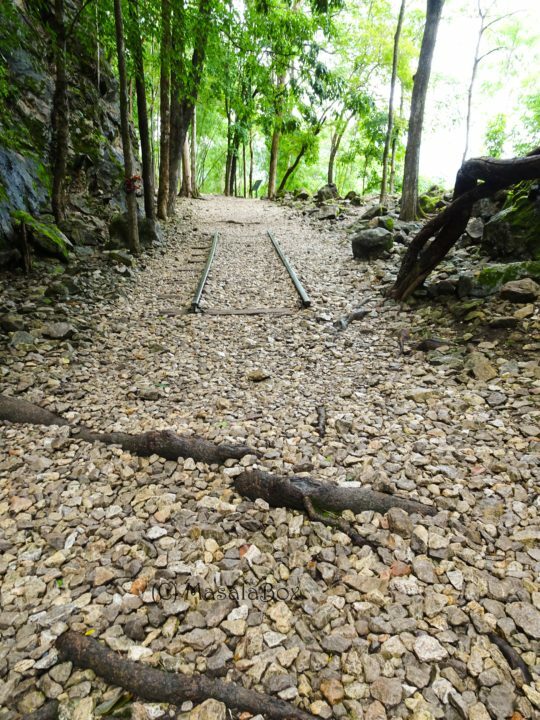 A steep set of steps take you down to the trail and from then on you are on the railway bed. The start of the trail warns of how you need a day to finish the trail. The rain had left a fresh lease of green color against the stark dark color of the rocks. You definitely need good shoes and water to get on this trail. The trek path is on the railway bed, so it is all stones and hence a good shoe is a must. Very soon you tumble into the section of railbed. We can see the railway line or the wooden plank or some tools used and left behind or placed behind.. To your left is the lush deep Kwae Noi Valley and to your right is towering rocks, sometimes as high as 8 meters. The railbed leads to a small memorial and I decide to walk further down. The trek path as such is not a very difficult one. There is a little bit of up and down, but it is a railway line so pretty much most of it is flat surface. The problem though is walking on the rock gravel of the railway line. The breathtaking view of Kwae Noi Valley opened up in front of me. There is a small resting place there and I sat for a moment. This! This actually gives you a picture of how thick the vegetation is in the area. Walking further I arrived at the Hammer & Tap cutting section. 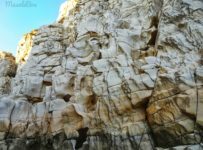 It is a technique used to cut through the rock. Out of nowhere the clouds gathered again and it started to pour heavily! Unfortunately I was not carrying my raincoat and my bag was not waterproof, the umbrella didn’t help much through the heavy pour. I decided to walk back instead of finishing the trail. I was surprised to see streams of water that had popped up in rain which were not there just an hour back when I crossed the path. My shoe sole also gave up in the rocky terrain. And I got so overwhelmed, so overwhelmed that I wanted to burst into tears. I was not able to stand this heavy rain and I still had a proper shoe in at least one leg, and I imagined the plight of men with no dress, working under the rain, in this rocky terrain, with no shoes, am sure there would have been many many leeches too, so impoverished and had to work at this place day and night. It sure was Hell!! If you are the empathetic or sensitive kind, HellFire pass is sure to get under your skin. You are walking through this path which once had 2,00,000 people working on, now a lone path, quite eeire. It was one hell of an experience. I went through the museum here too, wiped off the tears, freshened up and decided to wait for my friend to return from the trail. Our plan was to catch the train from its first station Nam Tok! About every half an hour or so bus passes through the HellFire pass bus stop. 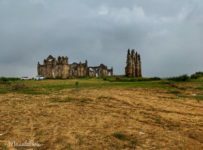 We walked down, found an empty bus stop, sat there looking at clouds and meadows, a bus did arrive and dropped us at the Sai Yok National Park. 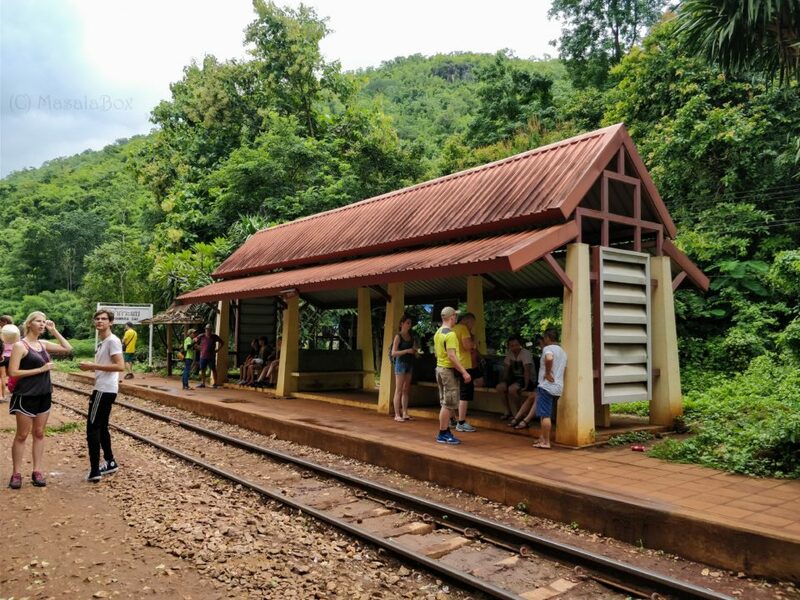 From Sai Yok national park songtheaws ply to Nam thok railway station regularly once it is full. Full in the sense, I had to sit bending my head like a convict because there was no space and was pushed to the corner where I had to fold myself! happens.. The train leaves at 3pm and the ticket counter opened at around 2:30pm. I was the first to get the ticket because I was dying to get the best seat and also lot of tourists started to pour in. A ticket to Kanchanaburi costs 100bhat. I got into the last compartment so that I could get a better view of the full train curving over the Thom Krasae bridge. Soon buses filled with tourists came in and the train was full with everyone trying to get a window seat and the tour guides asking them to find one too. 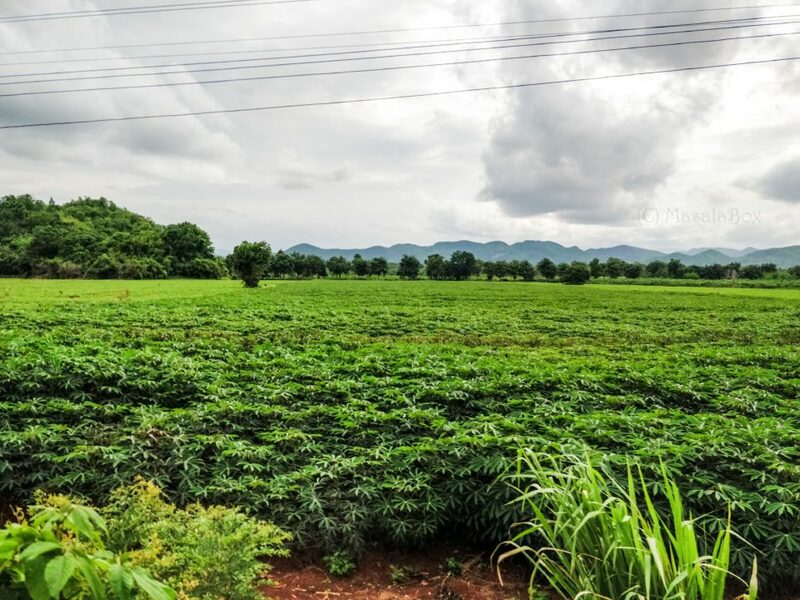 This ride was very scenic with the river Kwai peeping in from time to time, chugging over the trestle bridge and then comes endless farms of tapioca aka kasava fields. Tourists, part of tour operators, got down at various stations and the train was pretty much only for us upto Kanchanaburi. It was 5:30pm by the time we reached Kanchanaburi. Given the scenery and the ride, I have no complaints about it. The last thing that I had to do was visit the war cemetery and pay my respect. The Kanachanaburi war cemetery is locally called as the Don-Rak War cemetery and can be found right opposite the Death Railway museum. It is where most of the Australian, British and Dutch PoWs are buried. After the war, the bodies buried along the railway and other cremation grounds were excavated and brought here to setup a memorial. There is also a similar war cemetery on the Burma side. 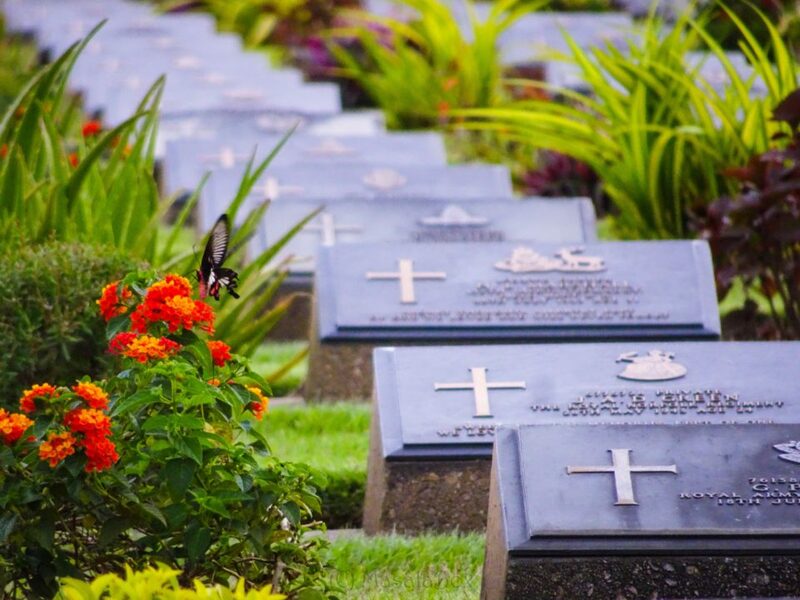 The war cemetery is maintained well and the lush green grass, flowers and chirpy birds made the place so warm! The irony of having a place in good condition to rest after you are dead! I walked through the rows and rows of memorial slabs which bore the name and nationality of the soldiers. People so young! The oldest was may be 45yrs. Everyone in their 20s and early 30s, off to war, working in such tragic conditions and die of sickness or cruelty, leaving behind their family and toddlers, lie buried in a foreign land!! That is one cursed life. And the people who take selfie here, have no life at all. Visit to Kanachanaburi and the death railway was a very emotional experience for me. Am not sure how many would appreciate to have a vacation this way; to learn history, to know about the times which was not so far, to know how cruel man can get, to know how blessed you are, to learn from the mistakes of the past. But have we learnt anything at all actually? At some part of the world war still goes on, some where the son returns home in a coffin, some where a baby is washed ashore, some where the mass massacre of the innocent still happens, some where the festival and celebration has died down, for someone it all becomes just a memory.. Will we learn anything at all? 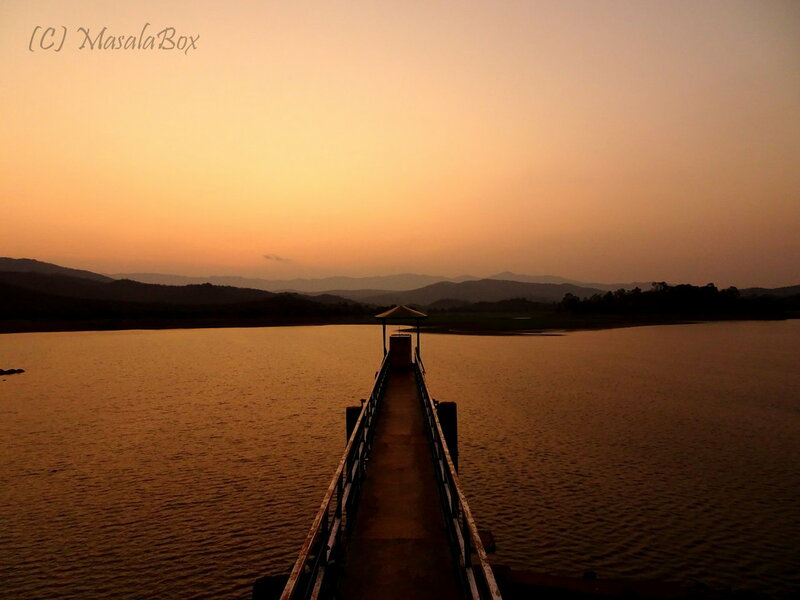 Kanchanaburi has lot of stay options. One option is to stay around the War museum. 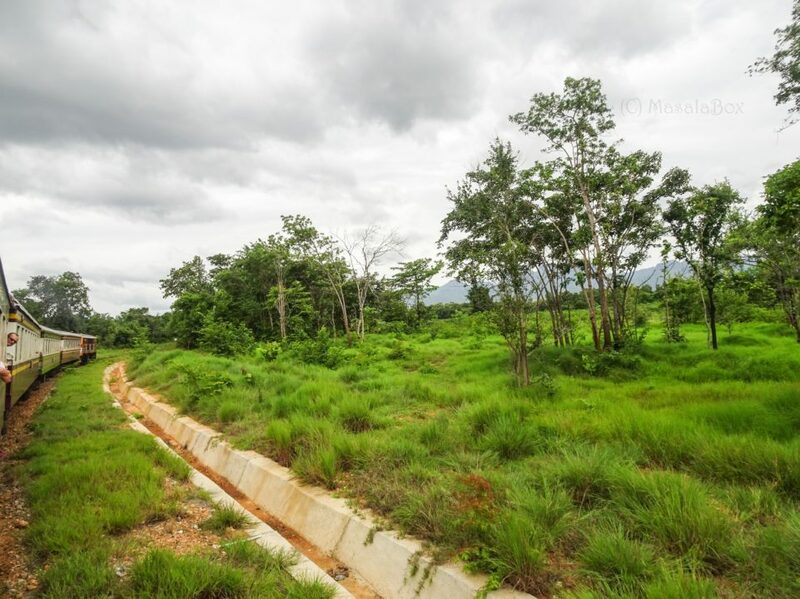 The Maenamkwai road is at walkable distance from the Kanchanaburi railway station and the War museum. This road is lined up with all the hostels and good hotels and cafes. Nice place to hang around, the weekly market is also just around the corner. Other option is to stay along the Kwai river. There are even floating cottages, the only problem is that you might not have the night life or easy commute to the city. 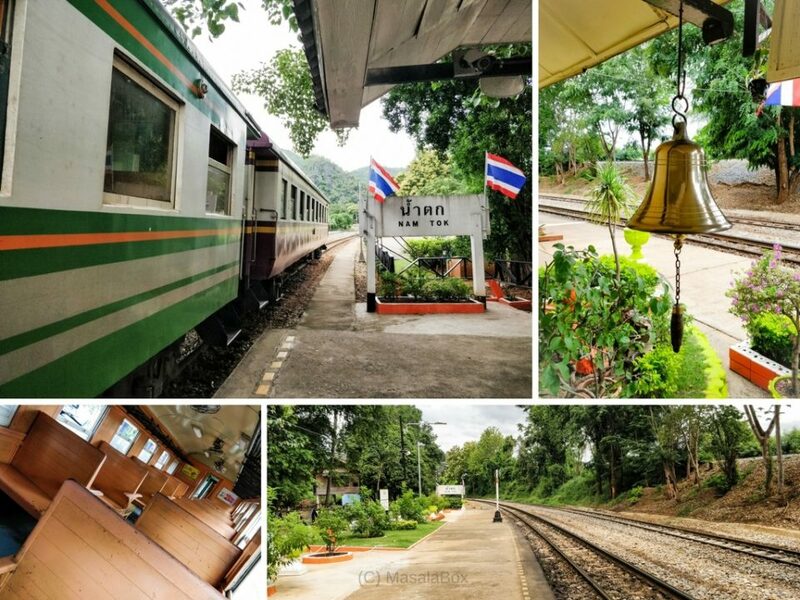 The other option is to stay near the Bridge over the River Kwai, this is the River Kwai Bridge railway station. Lot of markets and stay options around. Even I was not aware of all these things about the Death Railway. Glad to come across your post. Very detailed with great pictures. Loved this piece, it’s so full of good information and sound tips. Every time I watch “Bridge on the River Kwai I cry”. The kind of honour and pride that the POW soldiers had is unthinkable in today’s world. The movie is a fitting tribute to this trait amongst the soldiers who built the bridge. Visiting this place is certainly on my wish list. I got to watch the movie.. Am just afraid I might get all emotional again! 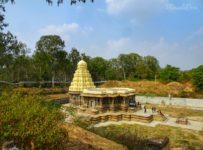 Beautiful post Chittra with lots of informations. 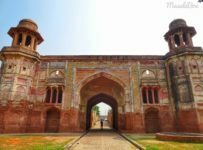 I had no idea about the tragic story of this place, really worth to visit. I visited river Kwai 3 or 4 years ago, nice place with so many history. What an amazing and beautiful part of Thailand. Thanks for sharing this, saving it on my next trip to Thailand. That is one epic post. I remember seeing the movie years ago and also reading about it subsequently but your blog post is another level. Fantastic post and in-depth research. Hope to tread this path someday. 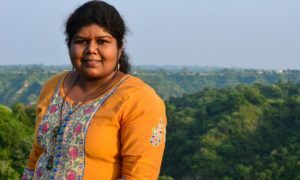 Thank you Shubham 🙂 It was one of the most moving part of my travel to Thailand.. Very well written, detailed, touching and in-depth post. Wishing all well in your travels. I wish to see this part of the world soon. What a fun way to travel by local train to the area and explore by foot afterwards. I love that there’s so many different things to do and see once you get to the main attraction and exploring the caves looks pretty cool. Nice post. I have watched the movie and your post also moved me. I have to visit there soon. Nice photos.